Have you have ever had to drag around panels for a round corral to work the ground, or just get them out of the way? Or have you ever had a wreck with a horse trying to jump over the panel, or get a leg caught in panel? Then you will appreciate this product! Halo Smart Round Corral is the world’s first suspendible, retractable, corral system! World’s first suspendable, retractable, smart, round corral! This one was custome built to fit this space. 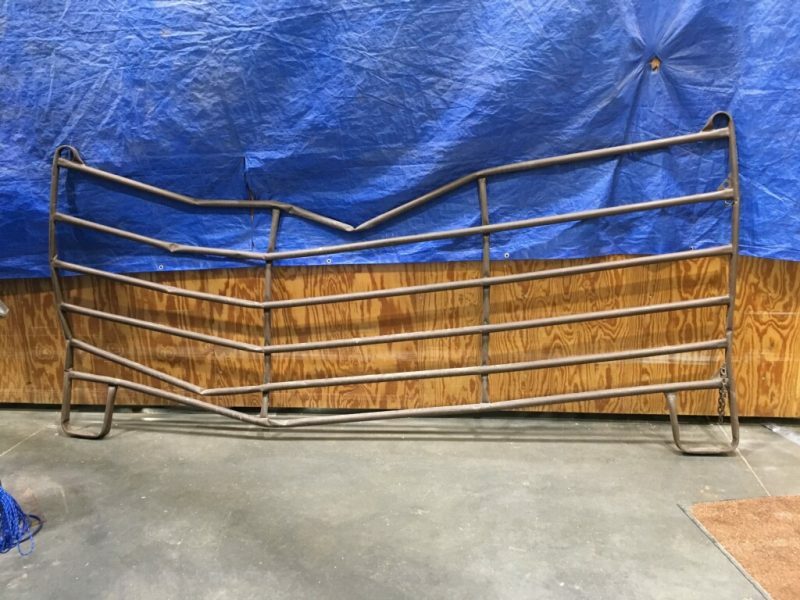 They can make Halo Smart Round Corrals in any size or shape to fit your space and needs. To see it in action watch the videos at bottom of this article. 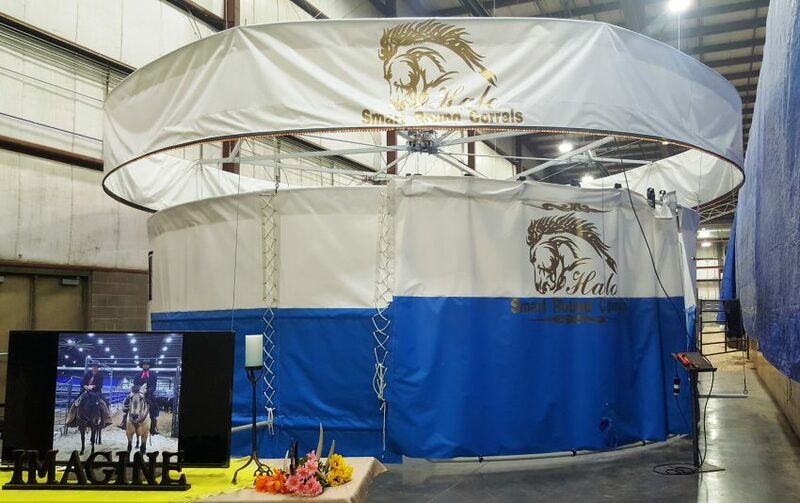 Kelly Stone and Glen Smith of Gillette, Wyoming came up with the revolutionary equine product idea of Halo Smart Round Corrals! Geer Fabrication, also local to Gillette, made the systems out of top of the line quality materials. Not only is Halo Smart Round Corral system easier than dealing with panels… it is also SO MUCH SAFER! The sides are 9′ tall so no horse would ever try to jump over it. The sides are made of a no-rip vinyl and it is seriously an amazing product that is basically impossible to tear! Can you imagine the injuries to the horse that wrecked this panel? That can’t happen with Halo Smart Round Corrals. 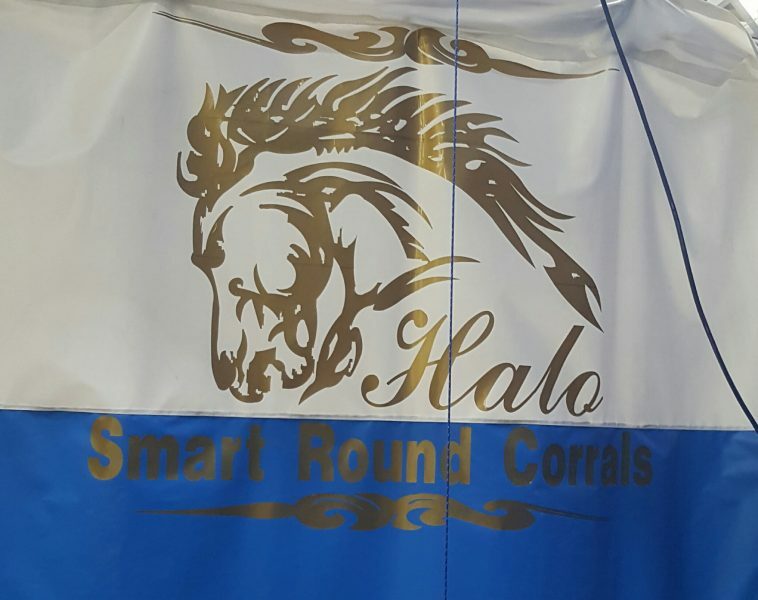 Halo Smart Round Corral system can come in any size diameter and any color combination you would like. Standard sizes are 30′, 40′, 50′ corrals, but really anything is possible! They can even build oval pens or stalls, or corner rounders for your barn that can be retracted up to work the ground. They can get out of the way by just pushing a button! You can also personalize your set up with your brand or ranch name embossed on the side! The SMART part of Halo Smart Round Corrals, besides working your horses in a pen that they can not injur themselves on like a panel, is the mounted camera system to record your training sessions! There is also a center cable lift that can be installed for multiple uses such as safely mounting disabled individuals for equine therapy or for attaching a saddle rack that can be put away by being lifted up under the halo with the corral. “Halo would also work well in veterinary practices. Providing a safe space for horses or other animals in rehabilitation after surgical procedures, with no exposed metal to tear out stitches, assuring the smoothest recovery process. 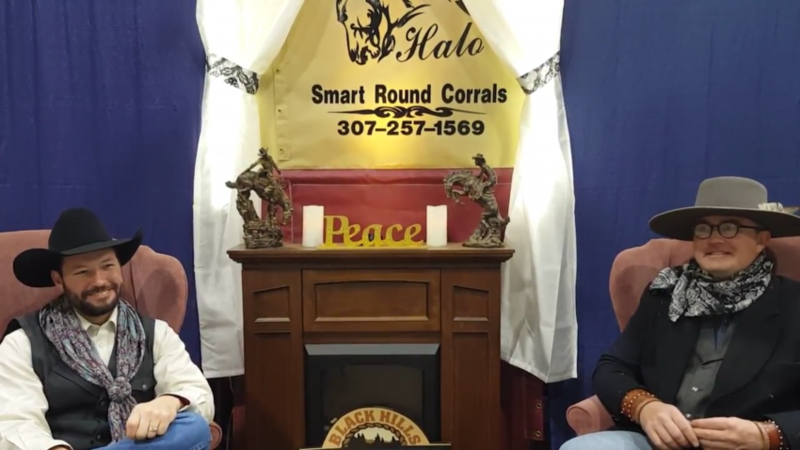 The animal could be monitored in an office setting from the mounted camera system that can display thermal imaging, and detect hot spots during the recovery process.” Kelly Stone stated while talking about Halo Smart Round Corrals. Yes, the rope lights that represent the halo are aesthetically pleasing and they sure do the trick when the Halo Smart Round Corral is tucked up under the halo hanging over the indoor arena… it actually looks like a chandelier hanging over a table. Halo Smart Round Corrals make a beautiful centerpiece in any barn! Halo Smart Round Corral – Retracting back up into the halo. Or give them a call and get more information about pricing and installation schedule.